I have learned from our readers that there are two sources for green motivation in families: the parents or the children. Eco moms and eco dads obviously pass on their green values to their children, but sometimes it is the children themselves that inspire a family to go green. I was one such child growing up that converted to vegetarianism (I did not get my family to do the same), and made my parents aware of environmental issues. My influence was not seen immediately, but I look at my dad’s avid recycling and my sister’s organic food choices and can’t help but think that my green values may have rubbed off on them. Now, there is a book to help children turn their parents green. 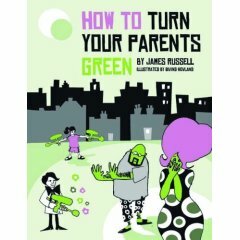 How to Turn Your Parents Green, by James Russell and illustrated by Oivind Hovland, is a humorous book for kids ages 8-80 (you are never too old to turn your parents green). This book helps alleviate eco-anxiety by empowering children. “The premise for the book is that grown-ups (the Groans) are responsible for causing global warming, but it’s you (the kids) who will have to deal with the consequences.” The tips in the book are what you would expect, such as eating organically, riding your bike, and turning off light bulbs; but the format is unique in suggesting how children can approach their parents. One suggestions is presenting your parents with a list of poisons in the household, such as cleaners, then giving them a month to switch to natural products. There’s even a section on how to turn your teachers green! As I can’t exactly watch my parents when they are in the bathroom, I have to take their word for it that they aren’t leaving the taps running. My mum is the worst culprit for leaving the tap on when she cleans her teeth. The book says to fine anyone 25p if they leave the tap on while brushing their teeth. I think it came to £2, before she got it into her head that tap off good, tap on bad. So a miracle happened when she turned the tap off when she brushed her teeth. Well done, mum. Anti-smoking campaigns have long recognized the power of children to influence their parents habits. Children can be a powerful force in making the world more green. The more books that are out there, the better, in my opinion. How to Turn Your Parents Green does a good job in presenting the information in a kid-friendly manner without downplaying the significance of our actions.